There’s something you should know about me: I consider minimalism to be a big part of my life. I’m not the kind of minimalist who counts her possessions, but I’m aware of how much I own, and I regularly go through my belongings to get rid of stuff I no longer use or want. Some people refer to this as simple living, due to minimalism’s reputation for stark white walls or people who live out of backpacks. I like the word minimalism, so I’m sticking with it. I have definitely not mastered the process: I’ve held onto certain items way longer than I should have, just in case I might need them someday. I’ve started challenging this way of thinking though, and over the past few weeks I’ve made an effort to identify and get rid of stuff I rarely (or never) utilize. One of the items I recently donated was a cupcake carrier which could transport up to 24 cupcakes at a time (I used to take them to family gatherings and friends’ parties on a regular basis). I haven’t made cupcakes in over three years, since before I went gluten-free. There was no need for this contraption to take up valuable kitchen cabinet space if I couldn’t fathom when I’d use it again. Out it went. I’m also much less likely to hold onto sentimental items. A few years ago I took all the photos I owned, scanned them to my computer, and threw away the physical copies. I don’t keep ticket stubs or other paraphernalia from events I attend; an entry in my calendar is sufficient to remember it. I’m not completely unsentimental, though. I do own items which don’t serve an immediate purpose (several stuffed animals from childhood, high school yearbooks, mementos from foreign travel). Since these items don’t take up a lot of room and I have space to store them, I’m okay with holding onto a few keepsakes. If I need to get rid of them someday (like if I decide to drastically downsize my possessions and move to a foreign country), I would do so in a heartbeat. I kept some of the estate sale items I bought, but the rest of them were donated (not the best use of my money, but at least none of it cost very much). I’ve since vowed to be more vigilant about what comes into our house, whether it’s something we purchase, or offered to us for free. It helps that I don’t enjoy shopping. I never did a formal shopping ban – I had no reason to – but the amount of stuff I buy has markedly decreased over the years. Browsing clothing racks fills me with dread rather than anticipation. I rarely buy anything for myself, other than groceries, toiletry items, and household needs. While I do purchase certain things in bulk (toilet paper, hand soap, recurring food items), it’s always something I know we’ll use up, and buying a large supply means I won’t have to seek it out again for a while. I really, really like not owning a lot of stuff. I’m not weighed down by my possessions. I’m not constantly hunting for new items to acquire. Although there have been times I’ve waffled over whether to keep something, once I’ve sold or given it away I’ve never felt a moment of regret. Once out of sight, it’s completely out of mind. 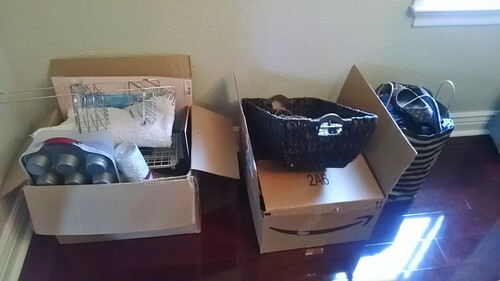 If my husband and I were asked to pack up next week and move thousands of miles away, we could do so with very little headache and drastically fewer boxes than many others in our situation (a child-free, middle-class, mid-30s couple who own a home). Minimalism can also be applied to mental clutter – reducing stress and not overextending yourself. As an introvert, I’ve adopted strategies which are conducive to maintaining a minimalist approach in my daily life: My full-time job as an admin keeps stressful situations at bay 95% of the time. I don’t pack my schedule full of events. I don’t feel guilty refusing a request if I don’t want to do something. I read a lot of books. For me, a minimalist lifestyle is about freedom. My husband and I would prefer to quit our full-time office jobs before reaching what most people consider a normal retirement age. The less stuff we buy, the more money we’ll have to contribute to our investment accounts. It’s my hope that minimalism – along with our commitment to frugality – will help us meet our ultimate goal of financial independence. Obtaining financial independence will let us choose how we spend our time, pursue a wider range of hobbies and experiences, and provide more flexibility on where we live and how often we travel, instead of being chained to our current 5-day-a-week work schedule (and in my husband’s case, regular 10-12 hour workdays). You may not focus on minimalism as much as I do, but I encourage everyone to think about what they own and honestly assess what is taking up too much space. I have a feeling you won’t regret it. When people visit my home, they always tell me – your house is always so clean! it’s peaceful! it’s organized! and I reply – well, we just don’t have a lot of STUFF. It’s as simple as that, really. We keep things to a minimum in our home as well and it’s absolutely freeing to not have a lot of possessions. Our home is comfortable but it’s not trendy, it’s not designer and we aren’t too sentimental about holding on to things. Just today my dental hygienist and I were discussing decluttering our homes. She suggested giving some of our things to my children. I said that there is no way my daughter-in-law wants more things in her home! But feel free to come and take anything you want. Hahaha! You are totally right. I can’t think of anything we particularly need for our place right now (in fact, I can think of a number of things I’d like to get rid of if Paul let me). I admire your ability to let stuff go! wish you could come help me there. I’m fairly good at not acquiring too much new stuff (baby items notwithstanding), but I have a really hard time letting go of things. For example, the waffle iron we’ve had for four years and not used. Maybe our kids will want waffles someday! Argh. We technically have the space, so I try not to stress too much and instead focus on keeping daily clutter (mail, magazines, etc) to a minimum. But I wish I were better at letting go. I know the rule and everything, and I still struggle! This post is great. I have been evolving into more of a minimalist, but two things make it a bit difficult to fully go all the way: 1. my love of print books. 2. my ideal home design style is “cozy” – with a lot of books, art, vintage finds. But regardless, I’ve been striving toward eliminating things I don’t need or that don’t bring me joy. I think that if my clothes, kitchen supplies, etc are edited down to what I truly need and like, then having books & art & a few decorative knick-knacks isn’t that bad. (I’ve also edited down my book collection quite a bit.) I love your rule about “if something costs less than $20 to replace”- very good rule! One thing I’m keeping an eye on right now is my waffle maker – I have a very nice one, but it sat unused for 2 years because it was on a high shelf in my closet (there was no room in my kitchen). Now that I’ve cleared out a lot of space in my kitchen, I’ve taken it out the box and put it somewhere very easy to access. I’ve used it once since then. I don’t cook breakfast very much – so I’m not sure how often I’ll use it even now, but having it closer might help. We’ll see. I think I have a fantasy in my head that someday we live in a house where we have guests a lot, and I cook breakfast. In reality, we live in a 1 bedroom apt, and hardly ever have guests. Those guests also usually love going out to all the amazing brunch options in Brooklyn. I think I possibly need to get rid of the waffle maker, and consider buying a new one if/when we ARE living the “B&B host to friends/family” life that I’m picturing in my head. I think there are several things in my home that might fall into that “fantasy future home” life that isn’t a reality yet. Thanks, Emily! I’m glad you liked the post. I definitely think it’s possible to have a cozy home and not be a strict minimalist — we have a bookshelf and also a few decorative things on our mantel. I think a big thing is getting rid of stuff that’s mostly unseen; like closets bursting with clothes and drawers/cabinets full of stuff you don’t use. At least with a one-bedroom apartment you’re kind of forced to limit your possessions due to a general lack of space.